Aside from being one of the world’s premier countries for wildlife watching, Costa Rica is equally well regarded in terms of adventure sports with everything from jungle trekking and zip lining to horse riding and kayaking providing no end of thrills against a totally tropical backdrop to truly savour. 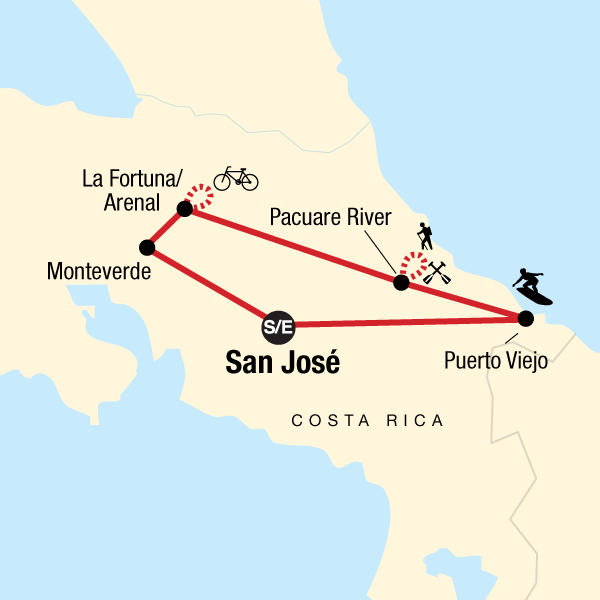 This 13 day multi sports holiday does exactly as it says on the tin and provides travellers with every excuse to get outdoors and active in Costa Rica all the way from the streets of San José to the beaches of Puerto Viejo via the awesome national parks of Monteverde and Arenal Volcano. If you’ve ever wanted to raft down the Pacuare River and spend a night in remote rainforest lodgings or take a free day in Fortuna for white water rafting or hiking around a dormant volcano, this Costa Rica holiday is exactly what you’re looking for and now’s your chance to dive right in.